1 Department of Neurology, Clinical Hospital Centre Osijek, Osijek, Croatia. 2 Department of Radiology, Clinical Hospital Centre Osijek, Osijek, Croatia. 3 Institute of Public Health for the Osijek-Baranya County, Osijek, Croatia. Key words: Aortic aneurysm, thoracic; Cerebral infarction; Intracranial aneurysm. Presentamos un hombre de 61 años con un infarto cerebral derecho y una arteria proatlántica persistente tipo I, que es una forma de anastomosis carótida-basilar primitiva. El paciente no tenía la arteria vertebral ipsilateral y presentaba hipoplasia de la arteria vertebral contralateral, mientras que la arteria basilar era suplida por la arterial proatlántica. Otras anomalías vasculares presentes eran un aneurisma fusiforme de la arteria subclavia derecha, una aplasia del segmento A1 de la arteria cerebral anterior derecha hipoplásica, que se originaba en la arteria comunicante anterior. A nuestro entender estas anomalías no habían sido descritas previamente. During embryonic development, five segmental arteries (A. trigeminalis, A. otica, A. hypoglossica, A. intersegmentalis proatlantis and A. intersegmentalis cervicalis) interconnect the anterior (carotid) and posterior (basilar) circulation systems1. By the 7-12 mm embryonic stage, these connections have involuted2, but proatlantal arteries (PA) persist until vertebral arteries (VA) develop. The persistence and failure of involution of such communications contribute to vascular anomalies in adults3. This communicating channel plays a critical part in irrigating the posterior circulatory bed4 and the persistence of the PA is a rare form of primitive carotid-basilar anastomoses. Considering the origin, there are three types of persistent PA artery: type I (the most common) originating from internal carotid artery (ICA), type II originating from external carotid artery (ECA) and the rarest form originating from common carotid artery (CCA)5. When PA is large, the VA is usually hypoplastic and the ipsilateral VA may be absent6. The clinical significance of the persistent PA is the possibility of developing atypical ischemic cerebrovascular disease, usually in adults5. On admission, a 61-year old man presented with a mild speech disorder and left supranuclear facial palsy (NIH Stroke Scale score 2) followed by high blood pressure (290/140 mmHg). As cerebrovascular risk factors, the patient exhibited well regulated arterial hypertension during a longer time period, hypercholesterolemia and chronic nicotine abuse. During the first two days of hospitalization his neurological status evolved to mild left-sided hemiparesis. However, this deficit resolved completely over the next few days. His blood tests showed high cholesterol level (6.49 mmol/L), fibrinogen (5.1 g/L) and homocysteine levels (18.7 µmol/L-analysis was performed on Abbott Axsym device). Electrocardiogram excluded heart arrhythmia (sinus rhythm 70/min). Computed tomography (CT) of the brain, performed at admission, showed marked lacunar ischemic changes in basal ganglia along with acute oval ischemic zone next to the anterior limb of the internal capsule on the right, measuring 10 mm in diameter, as well as periventricular white matter hyperlucencies consistent with small-vessel disease. Four days later, the follow-up brain scan showed identical findings. Color Doppler ultrasonography (CD) showed calcified atheromatous plaques in both carotid arterial systems, that is, almost fully calcified walls of CCA along with stenotic process of proximal segments of both ICA (50% left, 70% on the right). Incipient stenoses (less than 50%) were detected in both CCA and ECA. An artery with an unclear starting point, registered more cranial and rear than the left carotid bifurcation, was suggested by its Doppler flow pattern to be participating in cerebral circulation. The left VA was not detected, while presented short segment of the right VA suggested pre-occlusive flow pattern. 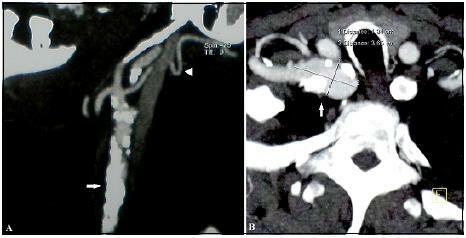 The angiography (CT angiography and magnetic resonance angiography) demonstrated the persistence of an anastomotic artery between the left ICA and basilar artery (BA), that originated from the left ICA at 1cm from its starting point (at the C2-C3 vertebrae level), entering the foramen magnum and adding up to BA, suggesting a type I PA (Figure 1A-B). According to ultrasound findings, we confirmed stenoses of the proximal segments of both ICA, as well as considerable calcifications and calcified plaques of the carotid arteries, expressed in both CCA, more on the left (Figure 2A). Both subclavian arteries (SA) expressed stenotic processes from their starting points (around 50%). Just after the right SA stenosis, a fusiform aneurysm was detected, measuring 36.5 mm in length and 18.4 mm in width (Figure 2B). The left VA was absent and the right VA was hypoplastic and could be detected only in V1 and short segment of V2. The right anterior cerebral artery (ACA) was hypoplastic in its full length – it originated from anterior communicating artery (AComm), and presented an aplastic A1 segment (Figure 1B) and was filling from contalateral ACA. proatlantal artery which supplied basilar artery (arrow). (arrowhead). B. Subclavian artery fusiform aneurysm (arrow). The patient was treated with antiplatelet therapy (acetylsalicylic acid), antihypertensive drugs (calcium antagonist, beta-blockers, thiazide diuretics) alongside with a hypolipemiant drug (rosuvastatin). One month after discharge he was examined due to transitory neurologic symptoms, during which a CT scan detected acute ischemic infarction of the right parietal lobe. Two and a half months after his first neurological symptoms, a carotid endarterectomy (CEA) with plastic patch was performed due to symptomatic hemodynamically significant stenosis of the right ICA. Just after the procedure the patient developed severe left hemiparesis because of a large ischemic stroke of the right brain hemisphere. His general condition was further complicated by bilateral pneumonia and azotemia, resulting in death. Ipsilateral or bilateral VA absence or hypoplasia are the most frequent anomalies in persistent PA, appearing in about 50% of cases. This case presented with the absence of ipsilateral VA, contralateral VA hypoplasia, and without intracranial connection with the BA. The only supply artery for the posterior circulation system was persistent PA. The origin of the PA type I was at the C2-C3 level, described as typical by Kolbinger5. Several literature displays describe anomalies of Circle of Willis along with persistent type I PA-most commonly the absence of one or both posterior communicating arteries5,7and hypoplasia posterior cerebral artery1. Hypoplasia of the A1 segment of the right ACA was described by Sato9 and Schoof1, but we found no evidence of described aplasia of the A1 segment. We also found no evidence that the hypoplastic ACA would originate from AComm, as the result of the development disorder of the Circle of Willis, which was present in our case. Considering the numerous detected cases of persistent PA, a high incidence of associated intracranial aneurysms was described by several authors9,10. Saito described the association of the PA type I with multiple vascular anomalies of the aortic arch11, while Basekim describes left brachiocephalic trunk2. Although some vascular variations have been described coexisting with the persistent PA, until now, we had not found a case of fusiform aneurysm of the subclavian artery with a persistent PA. The association of multiple atherosclerotic stenoses, along with persistent PA and appearance of multiple calcified atherosclerotic plaques, is consistent with data found in the literature5,8,12. The extremely calcifications of both CCA that were present in our case have not been described in recent publications. The unfortunate outcome of our patient, sadly confirmed that our early aggressive approach towards a surgical management, fearing that a persistent PA could be a source of further complications for the surgeon performing carotid endarterectomy, was right8,12. The absence of one or both VA provides an important clue in the diagnosis of persistent fetal vascular communication between carotid and vertebrobasilar arteries. Although the PA is usually an incidental finding, in some cases it might prove to be of clinical importance. 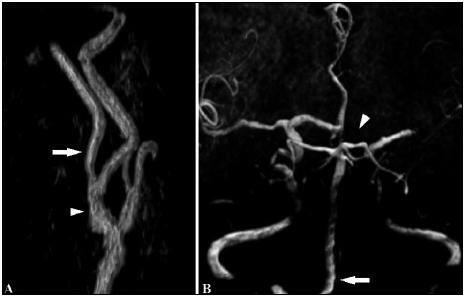 Our case demonstrates the clinical significance of a persistent PA and associated vascular anomalies in the evolution of ischemic cerebrovascular disease. Awareness of these vascular variations may modify surgical tactics in the context of endarterectomy for carotid stenosis. To our knowledge, this is the first report of a type I persistent PA associated with fusiform aneurysm of the SA, aplasia of the precommunicating ACA (A1 segment) and extensive calcifications of the both CCA. Recibido el 28 de octubre de 2014, aceptado el 22 junio de 2015.